"We are not a Hostel, we are a HOMEstel"
Barbatuke Hostel in Malaga was born to offer cheap accommodation for everyone who wish to visit Malaga. Step by step it became something else, a place to meet people and enjoy the quiet and pacefull neighbourhood. It's a beautiful place with a great atmosphere. Our goal is to make you feel like at home, that's why we are a HOMEstel. 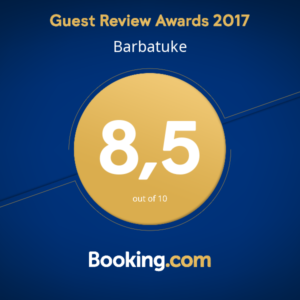 We are very proud of being awarded with the Guest Review Award 2017 granted by Booking.com. This gives us an extra boost to keep working hard, so our guests still feel at home. We offer a total of 9 rooms: 1 Suite with private bathroom and jacuzzi, 4 doubles rooms, 2 singles rooms, 1 4-beds Dorm and 1 6-beds Dorm. We have 3 types of breakfasts. A Buffet breakfast including: Coffe, orange juice, toasts, butter, jam, turkey, cheese, cereals and milk. The Deluxe breakfast includes: Coffe, natural orange juice, multicereal toast, olive oil, smashed tomato, spanish ham, fresh cheese, avocado, greek yogurt with fruits and muesli. Cereals breakfast includes: a cereal bol with 2 topics and coffee. All the rooms are cleaned weekly in case the customers stay longer than 1 week. We offer full laundry service for 4 Euros. We wash the clothes, we dry it and folder it, so you don't need to worry about anything.